We all know skiing holidays can be costly… All the extra bits like lift passes and apres ski drinks really do add up! However, we believe a great ski trip doesn’t have to break the bank. The little things can make a big difference. 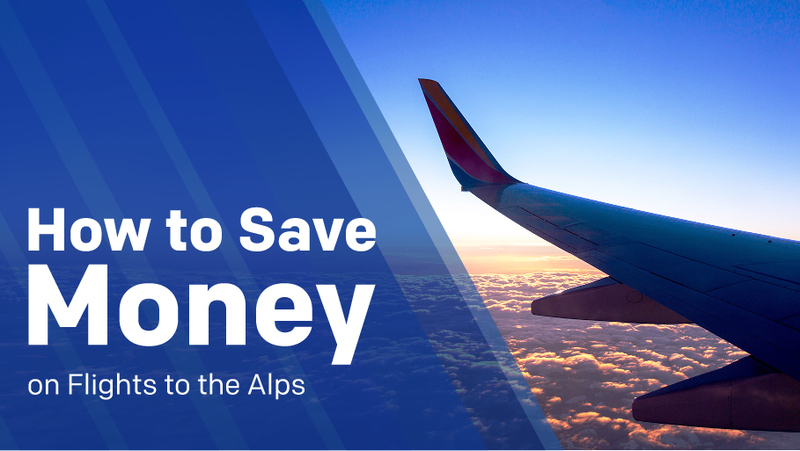 Here’s how to save money on flights to the Alps. One of the best ways to find a good flight deal is to be flexible on dates. The Alps are one of the most popular skiing destinations (for good reason!) and ticket prices soar in peak season. We suggest heading out earlier or later on in the season to find the cheapest flights. However, make sure to choose a high altitude resort to get the best chance of snow. Avoiding school holidays is also a great way to save, although when travelling as a family this isn’t always possible. Instead, you could think about which day you travel as the cheapest days to fly tend to be mid-week. Have a play around with dates and times or look at different airlines for the return flight to discover the best deals. It’s almost always more affordable to find a good deal if you book flight tickets well in advance. We recommend at least two months before you plan to go away, but the earlier the better. That being said, it can be cheaper to book last minute flight deals for a real bargain. That’s if you’re happy to risk not being able to find your desired dates and it may prove tricky when booking for a family or large group. You can track flights with an online flight tracker tool to bagsy your tickets when they’re cheapest. It’s worth having a look at all the airports in the surrounding area, especially smaller ones, to see if they offer cheaper flights. If you end up booking from an airport a little further from your resort, make sure you research how much it costs to get there. Although booking flights as part of a package holiday can be tempting, what is advertised as a cheap deal can often be deceptive. Booking flights yourself allows you to be flexible with dates and airports to find the most economical option for you and your individual needs. Have a root around on different websites to make sure you don’t miss out on anything. Doing it yourself also means sidestepping unexpected tour agency booking fees. Lots of airline websites use cookie policies to remember your information and track your searches. Some people think this means that the more you search for a particular flight, the site ‘thinks’ you are serious about booking and ups the prices. Although debated, it’s worth clearing your cookies to avoid any unwanted price surges. To do this go to the privacy settings on your computer or clear your history. Another way of stopping this from happening is to search for cheap flights in incognito mode so you can compare flights without being tracked. Some credit cards offer air miles as an incentive to join. Using a credit card everytime you go out to eat could eventually be converted into flight savings. If you pay for your flights with a credit card you’re financially protected if the airline cancels your flight last minute, even if you don’t have travel insurance. Getting your skis to the resort can be tough for many reason! Harsh baggage policies are a hidden cost that often catches people out. Many airlines don’t include ski equipment in their hold luggage allowance and charge an additional fee. Even if the airline does allow skis, boots and poles, there are weight and size issues to consider. You could choose an airline without these restrictions, but the budget airlines are usually pretty strict when it comes to luggage and you might end up paying a higher fare for the privilege. To avoid baggage restrictions and costs altogether, why not make use of our reliable, long-term ski equipment storage service. Simply leave your skis and snowboards at our deposit and we’ll keep them safe and well serviced until your next season. This way you can travel without the hassle and expense of bulky equipment and hop on a plane with just your hand luggage and a sense of adventure! With these tips and tricks up your sleeve you’ll have more cash to spend on the important things- like drinks at the bar! Public transport can result in delays, wasting precious slope time. But, booking a taxi from the airport can sometimes be expensive. The solution? Us an affordable and convenient ski transfer service! Ensures you don’t end up being fleeced at the airport, while giving you the most time on the slopes possible. It’s the best of both worlds!